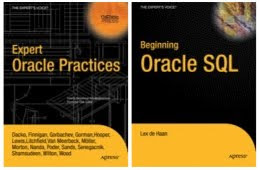 I'm very pleased to announce two Oracle related books I have co-authored are to be published shortly by Apress. As we have seen in the previous posts of this series, in 11g a new figure named "NewDensity" has been introduced as a replacement for the "density" column statistic for columns whose histogram has been collected; this change has been backported in 10.2.0.4 also. See http://tkyte.blogspot.com/2009/10/back-from-oracle-openworld.html for the original reference. Anyway, I saw an article and it made me laugh - and sort of cry at the same time. It has to do with the use of default values. A lot of developers/DBAs have a very certain fear (that is the best word I can think of to describe their attitude) of NULL - the 'unknown' value. So, instead of using NULL for an effective_end_date field (for records that we don't know the end date for, they don't have one) or using NULL for values they do not know the value of - they use some 'fake' value. This fake value is assumed to be a value that could never possibly be used. I'm sure when the developers implemented this system - using XXXXXXX for a license plate value that was unknown seemed 'reasonable'. I mean - who would ever ask for a vanity plate with seven X's on them? Understand it, but don't fear it. Simple, don't go into graphic design, Choose something else. Cause if you don't do "that" work, other designers will. Do people really think that everybody enjoys their job?